This is the third installment in a series of reviews of multi-stage backpacks (part 1, part 2, part 4). After the Atacama Crossing I posted a series of reviews of backpacks to show the best features of certain packs and also to show what options are available for multi-day races. One of the reviews was by Joel about his Salomon XA25 WP backpack. He concluded that he would recommend the pack, but also noted that he would be looking for a smaller pack for his next race. 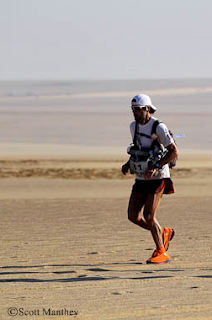 Joel recently completed the 4Deserts Sahara Race finishing in 7th place overall (his excellent race report available here). 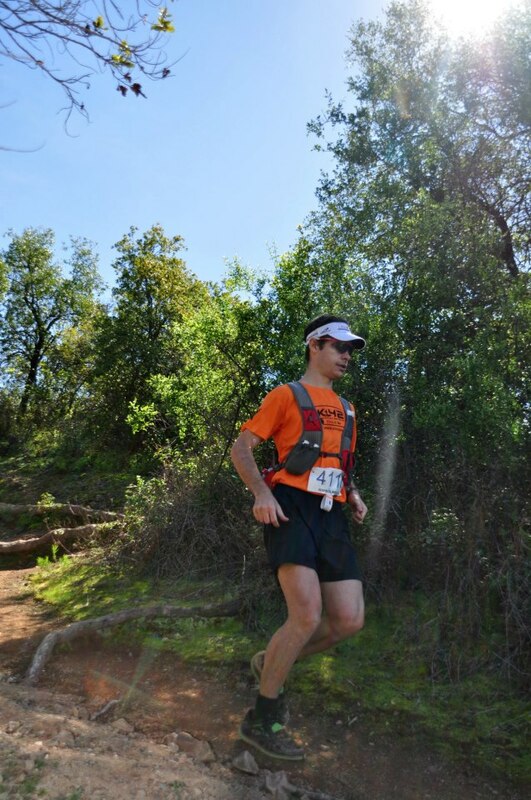 He used the Raidlight Evolution 2 for the race and provides his feedback on the pack below. 1. What pack did you use during the race? 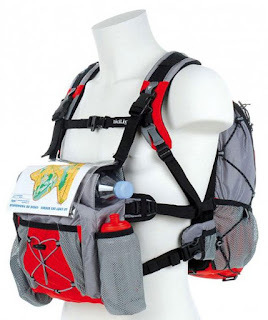 For the 2012 Sahara Race, I used the Raidlight Evolution 2 Pack with the included front pack. 2. Did the pack have enough capacity for all your gear? At 24 total liters (20L back/4L front), I had plenty of room to pack all of my gear and still had room to spare. The compression cord system on the Evolution 2 easily shrunk the bag down to reduce any movement of gear within the pack. My final pack weight was 6.5kg. I had weighed-in at an even 6kg, but I chose to add some last minute calories. 4. How did the pack fit and ride while you were running? The pack felt really good. Very secure fit. I trained with a Salomon XA 20 pack, which sits very high, and I chose to move away from the Salomon XA 25 WP, which sat too low on my back. The Raidlight pack sat just right and I had very little movement from either the back or the front portions. The Raidlight pack has a front pack with a top, insulated sleeve meant to hold water bottles in the horizontal position. I used the 1.5L water bottles provided by the event. It fit perfectly into the sleeve with minimal front pack movement only when the bottle was entirely full (just after each checkpoint). That movement disappeared after drinking ~.5L out of the bottle. I stashed a 1L collapsible Platypus pouch into my front pack to simply make the minimum required capacity. Not only was this a very simple system, but it also proved less time consuming than using front-loading bottles and helped me move seamlessly through checkpoints. 6. Did you use the external pockets on the pack? What for? I did not use the side pockets on the waistbelt of the pack, since everything I needed fit easily into the large back compartment and the front pack. I did use the small top pocket on the back of the pack to hold my rolled-up camp sandals in order to keep them separate and to reduce the amount of sand getting into the pack. 7. Did anything break on your pack during the race? The only thing on the pack that even appeared to be worn was a very small section of stitching on the top sleeve of the front pack. This was caused by me repetitively removing/replacing the water bottle. It did not fail or tear, and when I use this pack again I will simply reinforce the seam with some top-stitching of my own. 8. Was there any specific feature that you particularly liked? I really liked the way this pack fit. It really just hugged my body and became part of me, so I didn’t even notice it. The front pack attaches to the back portion at 6 different and well-spaced points, making any movement minimal up front. I loved the top sleeve to hold my water bottle. This was a huge bonus to have. 9. Was there anything that you would change about the pack? The only issue I had with this pack, and it’s a minor one, was that the zipper on the front pack seemed to always get caught in the fabric lip that covered the zipper. I was constantly having to pull it out of the zipper while on the run and it did become an annoyance. 10. Would you recommend the pack and would you use it again? I’m not sure I would recommend any OTHER pack. I plan to use this pack again in next year’s Gobi March and for any future races requiring a large amount of gear. Raidlight seems to be at the top of the pile when it comes to race gear R&D. They get the input of the athletes who are actually using this stuff out in the field and they get exactly what you need into a pack and nothing that you don’t. I like Salomon gear, but there seems to be a disconnect at some point in the engineering/production process. Many of their products either do not function properly or they have systems that do not fit together (i.e. water bottles that don’t fit into their intended holders, mismatched buckle systems). Raidlight has some new packs in the pipeline, but it would be tough for them to beat this one. Last week I went to San Pedro to train in the desert. The plan for the trip was to run a high mileage week while testing out some gear and adapting to the desert conditions. It was a tough week of running as I had just raced the Ruta del Condor on the weekend and was coming out of a few solid weeks of training. The Atacama is high at 2,500m and very dry. It's also hot, but due to the other conditions that somehow didn't seem as bad as I expected it to. I struggled on my first three days of running and did not run strongly at all. However, by the fourth day I was feeling a lot stronger and managed to run much more smoothly and efficiently. I had an amazing week, rekindled my love for the desert and remembered just how hard it is to run there! The valley and river outside of San Pedro. The valley and river close to San Pedro. A typical trail on Stage 2 with lots of climbing and rocks along the way. The spectacular Cordillera del Sal. Some really difficult footing in a salt flat. The last tree in the desert on the way to Laguna Cejar. Laguna Cejar: the location of the camp after Stage 2. More tough footing, this time on sandy ground. Searching for the Tunnel to go to the end of Stage 1. The tunnel that links San Pedro to the end of Stage 1. The long, gradual climb at the end of stage 1. A long windy river that shows the way from the dune at 40km to Valle de la Luna. The descent of a virgin dune that marks 40km on the long day. The road through Valle de la Luna close to the Tres Marias. A view of the Cordillera del Sal and San Pedro in the distance. A narrow canyon leading to Valle de los Muertos. A route that I shouldn't have taken in the Cordillera del Sal. The salt road leading up to the Valle de la Luna. The Ruta del Condor is a famous route in the mountains outside of Santiago. It starts in Cajon del Maipo and climbs into the Andes before descending to the main road that goes to Far=rellones. Typically people choose to cycle, hike or motorcycle the route as the trail is in good condition and suitable for all of these activities. 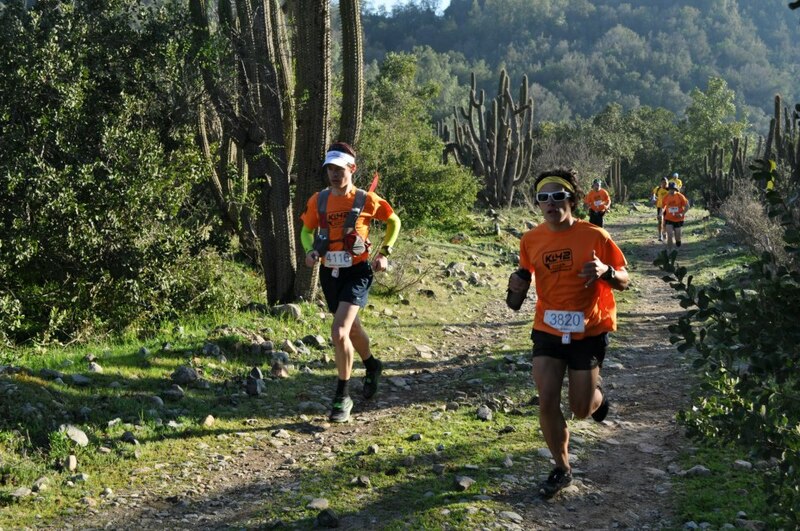 The race was for both running and mountain biking and everyone started at the same time in Alfalfal in Cajon del Maipo. At the start with Max. It wasn't a big start as there was a small field for both the running and mountain biking sections. Fortunately my friends Max and Patrick were there so there was some company and good runners to race with. Based on the quality of the organisation leading up to the race I wasn't too confident in the number of aid stations and the amount of support we would have for the race. I used my new Lafuma pack with a bladder and bottle and plenty of food to keep me going for the day and later found out that it was going to be needed. Patrick and I started out at a gentle pace and moved towards the front of the field. It was an easy start to the race with rolling hills as we ran into the valley. Max quickly joined us as we reached the start of the climbs that would go on for a very long time. The trail was smooth and climbed up switchback after switchback as we lifted out of the valley and made our way to the highest point of the race. Patrick dropped off the pace as he was holding himself back before a 100 miler in a few weeks and Max pulled ahead of me slightly as he loves the climbs and seems to be getting stronger at them in every race. Looking back towards the start. We held these positions, Max in front of me and Patrick a little behind, for the next couple of hours as we climbed. The route was beautiful and the views spectacular. I saw three or four condors along the way which was quite a treat and obviously where the route gets its name from. Unfortunately the race organisation was very poor. There was no marking of the route, none, and the first aid station we were promised at 14km wasn't there. I had all the food and water I needed and was fortunate I was carrying a fuller pack than I would normally carry. Some of the early climbing. Capturing a few photos on the way up. At the 26km point we had reached the top of the climbs. Our positions were still the same and I could just seem Max about two to three minutes in front of me. The terrain felt like we were still climbing, but it was more like rolling hills for the next 14km that climbed ever so slightly. 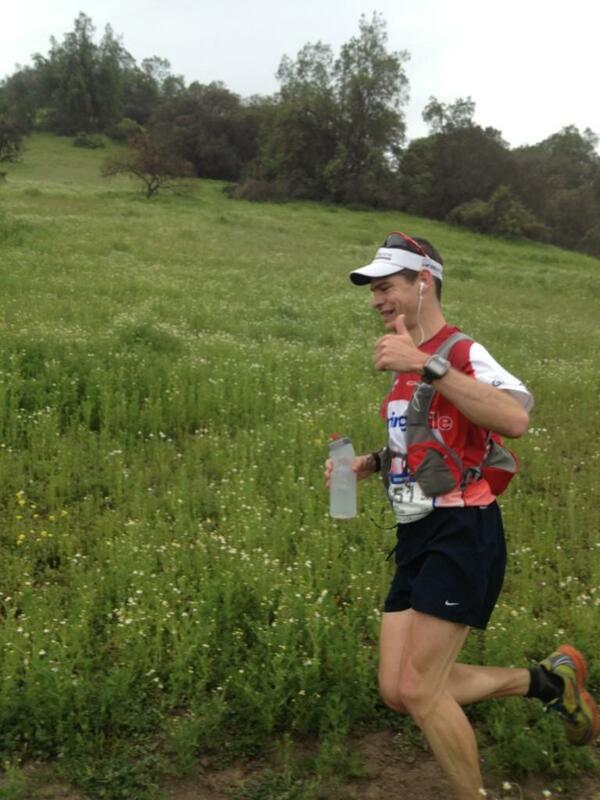 I really enjoyed this section of the run as it was breathtaking landscapes and very runnable terrain. After rolling through the top section of the course we reached the 40km where the one and only aid station of the day was located (after being promised at least 3 aid stations). I filled up a bottle with the sickly sweet pineapple flavoured drink (the only option) and raced on to try and catch Max. The final switchbacks before we reached the top. Very happy to be at the top of the climb. The rest of the route was all downhill and it was quite steep. I've gradually improved my downhill running this year from the K42 in September to the Endurance Challenge in October and now the Ruta del Condor. 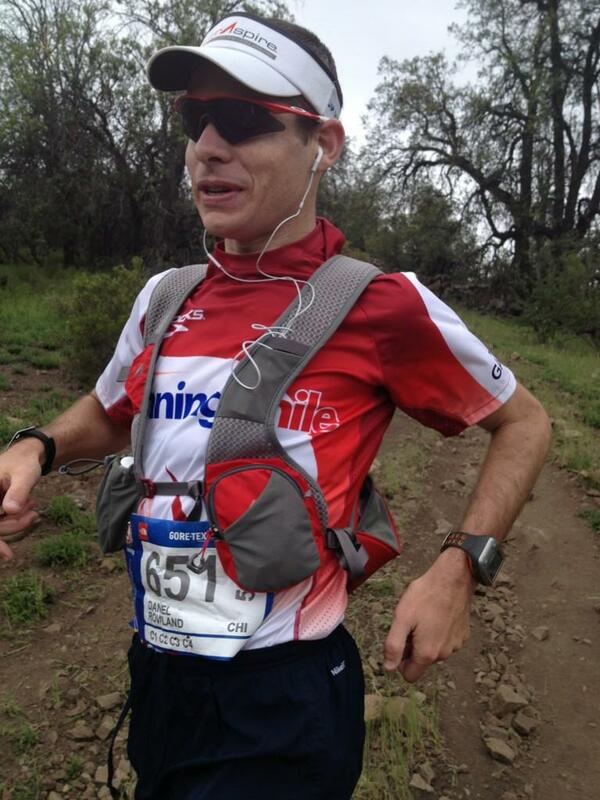 I felt confident and fast and that was rewarded by catching up to Max in the first few kilometers of the descent. I was able to run away from Max without pushing myself too hard and settled into a rhythm on the way down. I ate the last of my food to keep me going to the finish which I believed was at 53km and then slowed the pace a little so as not to beat my legs up too much with the continuous downhill. After about 9km the descent ended and the route curved around to the left where I could see a tent and banners. I assumed that it was an aid station, but when I arrived I realized it was the finish (the race was 4km too short). I was happy to be finished and even happier that I had won my first race! Max came in a few minutes later and then Patrick a few minutes behind him. It was awesome to have three friends on the makeshift podium and a fun day of running. A final river crossing which was actually the finish! The podium: Patrick 3rd, me 1st, and Max 2nd. I'm very pleased with the progress that I've made over the last three months, a 7th at the K42, a 5th at the Endurance Challenge and now a win at the Ruta del Condor. While all very different races I've made some good gains in strength and sorted out some of my weaknesses along the way. If everything goes according to plan I'll keep on improving with every run. Showing off my new Lafuma pack at the finish. This morning I won my first trail race, the Ruta del Condor! It was a tough race with lots of climbing and a brutal descent to the finish. My time was 4h54min for the 48km. At the finish line with my new pack and a huge smile! Full race report to come with details of the race, the dodgy organization, and my new Lafuma backpack. Excellent news: I have joined the Lafuma - Compressport - 110 Sport and Health running team. At the moment this team consists of three runners: Rodrigo Errazuriz, Felipe Contreras and me! The team had its first outing at The North Face Endurance Challenge where Rodrigo was 3rd in the 50km and Felipe was 26th in the 21km (I was 5th in the 50km, although this was before joining the team). The ski, mountain and trail running brand from France. Availability of products in Chile has just started and the brand will be developing significantly in the future. A small selection of products is available at the SportOne store in Mall Sport, but the range will be extended in the future and new stores are planned for March 2013 with a flagship store in Mall Sport. The veino-muscular compression technology brand from Switzerland. These products are also available in Mall Sport and through internet sales directly from Israel, who is the Compressport representative for Latin America. This is the first sporting medical centre in Chile with the objective of developing medical sports coaching. In addition to sports coaching the centre offers extensive sports testing and injury rehabilitation. I will be racing and training with the team as well as sharing information about the products and details of the team's sponsors. There are links on the right of this page to each of the sponsors where you can get more information about each brand. I am extremely happy to join the team! This will provide the opportunity for me to train and race with excellent products and also be part of a team environment where I will be challenged to perform to the best of my abilities. 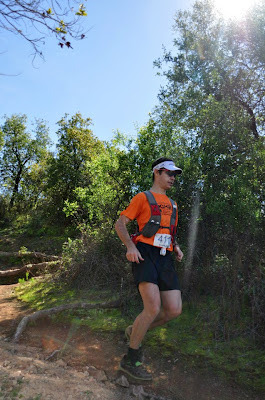 This weekend I ran The North Face Endurance Challenge event. This race that is organised by The North Face has been held in Chile for a number of years, however, it only became part of the Endurance Challenge series of races in 2012. I started the 80km race in 2011, which was called the Ulramaraton de Los Andes, but did not finish due to injury. This year I ran the 50km. RunningChile team before the start. It was a beautiful morning on Saturday and as the race started at 8 o'clock it was already light and looked like it would be a hot day. The start line was at Hacienda Santa Martina which is a magnificently located club in the mountains with fantastic single track for a few kilometers surrounding the start and finish area. I started the race in my RunningChile t-shirt and a pair of shorts as I thought that would be warm enough for the race (I still threw a wind jacket into my UltrAspire pack just in case) and for the greater part of the day it was. I didn't start at the front of the race as I have become accustomed to the ridiculously fast starts here that have put me off my pacing strategy in the past. I rolled out of Santa Martina and not surprisingly caught up to most of the fast starters on the first climb. I was feeling fresh and strong after a good taper week and the early pace was exactly where I wanted to be. I held my position in the top ten and enjoyed the awesome trails that surround the club. River crossing in the Santa Martina area. Beautiful single track from early in the day. There were great undulating climbs and the trails led us through a few small river crossings, weaving amongst the trees and over the smaller hills. We also followed a course that led us off the usual trails and cut through some natural areas that I would not normally run on as there was not evident trail to follow. The first 15km of the race followed this pattern and I managed to settle into a rhythm, move up a few places and begin my nutrition strategy for the race. The next part of the course took us the climb of Huinganal, a small hill that's easily accessible from La Dehesa. I've run this climb before with the RunningChile team and it is a perfect gradient to run as it is not too steep. At this point the field that was quite close around me started to seperate and I felt that I was making progress and moving forward amongst my competitors. I was still feeling strong and enjoying the trails as we climbed and then descended to the lowest point of the race and the beginning of a long and persistent climb. In my mind we were in the back section of the race, somewhere furthest away from the start and finish, and the trail had become a dirt road that winds along the contour of the mountains and gradually climbs for what seems like forever. I thought that this part of the course was quite ugly and it was certainly not technical or challenging footing as it is just a service road and not a trail. The climb was long with varying gradient that took us from 23km to about 42km - that's a lot of climbing! I maintained quite a good rhythm through this section, catching up a few places and running in my best position of the day which was with the eventual 3rd and 4th place finishers. Unfortunately towards the end of the climb I started to feel the mileage building up in my legs and dropped off the pace of 3rd and 4th place and settled into the position that I would maintain until the finish. I was within sight of those two places on the later part of the climb but as I turned around a corner on the service road at 42km I could not see them ahead of me anymore. It was strange as there were a good 5 or 6 runners from the 80km race on the road ahead of me (the 80km race started at 4am and our race was timed so that we would finish at roughly the same time), but nowhere could I see the two runners I was looking for. I resigned myself to the fact that I must be dropping off the pace much faster than I thought. However, as I turned the next bend a marshal told me that I would be taking the trail to the left as I was in the 50km race. So that was where my competitors had gone; I felt a momentary sense of relief that I hadn't slowed too much. It was momentary because I looked to the trail on the left, which was not really a trail, but rather a massive climb that seemed like a wall of mountain to summit. It probably wasn't as tough as it looked, but it was very demoralising to see such a huge climb after running 43km. I fought my way up the climb, my pace dropping as low as 3km/hr at some points due to the steepness, and kept plugging away to get to the finish. As I approached the top there was a magnificent view of the valley below and Hacienda Santa Martina was visible in the distance. Back into the Santa Martina area as we approached the finish. Each distance had a different colour tape - blue for 50km. On the descent I ran a steady pace, much stronger than I had done just a month ago on the K42 descent, and enjoyed using some different muscles to the ones that were hurting on the long climb. The descent was steep and long, but I was feeling quite good and with my GPS I started counting down the distance to the finish. It's always a great feeling to know how much time is left and as I had already run for about five and half hours the final 20mins to 30mins seemed manageable. That was when I ran into the final aid station, my Garmin reading 49km, and I was planning to push and run the last 5mins hard. However, another suprise awaited me as the aid station volunteer informed me that there 6km to the finish (6km!!). This was a second low point after seeing the wall of a climb at 43km, but it was close enough to the end that I didn't lose too much focus. Only a few more kilometers to the finish. In that final section of the race I hoped not to be caught and tried to maintain my pace all the way to the finish. In the future I want to be running hard and chasing down positions at that point in a race, but it was not to be on Saturday. I didn't lose any places and it was great to finish up the race and see V and hearing her and Patrick shouting me in. I finished in 6hr33min in 5th place overall and 2nd place in my age group. A good result and fair reflection of the work I put in since the K42. Very happy to be finishing for the day. At the end of the day I was happy with my performance as I ran to the level of fitness and strength I currently have. That needs to improve (as always), but I couldn't have asked for any more on the day. It was also great to run a little with Max, who is getting stronger with each race, and Canuto, who has put down some amazing performances in big events this year. Finally I settled down, with very sore legs, and cheered in the rest of my RunningChile team mates. It was a great day. An interview in Spanish is not so easy after running for 6hrs! The course profile: a long climb from 15km that ends steeply at 43km. V and I traveled to Easter Island for a holiday at the end of September. It is a beautiful and calm little island and there's not much more to do there other than see the Moai and other historical sites. The island has one town and the rest is fields and open space which is great for running. I went on quite a few runs while on holiday. I went up the famous Rano Kau crater a few times, I did a run to the highest point on the island and I also covered most of the trails on the town side of the island. On the 22nd of September we did an unofficial Rhino Run together to show our support and to spread the word. 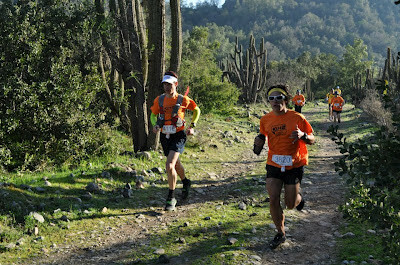 It was a great break and a good chance to run somewhere warm and tropical as we are just starting spring in Santiago. Beautiful trail along the rim of the Rano Kau crater. On the way to the crater is a cave with Birdman paintings. There were lots of beautiful sunsets on the island. V showing a "Stop Rhino Poaching" sign on our Rhino Run. Team 505 photos on the Rhino Run. An early morning run with Moai in the background. From the highest point I could see sea all around the island - spectacular! 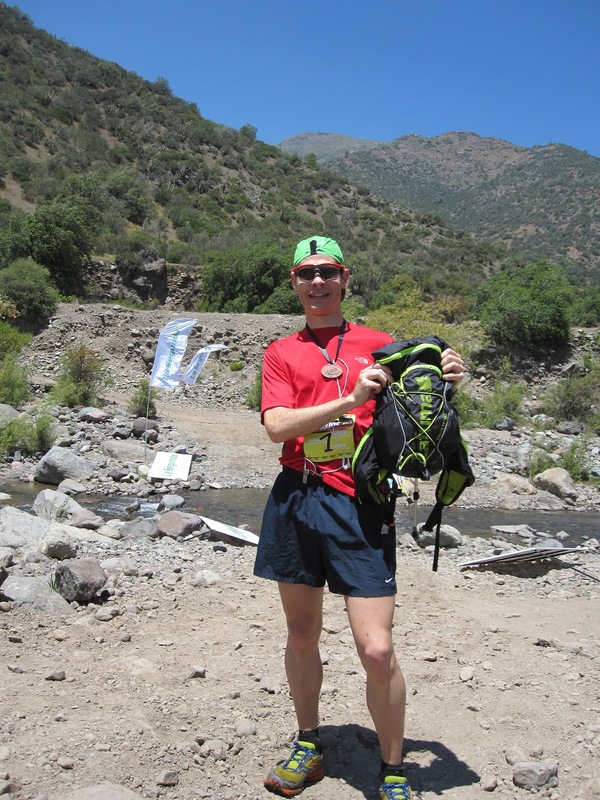 This year was my second year competing in the K42 Chile Adventure race. Last year I finished 5th after a race with many high and many low moments, terrible blisters and a huge fade at the end of the race that required walking most of easy trail in the final kilometers. I was happy with my run last year, but this year I was hoping to have a better performance due to a good build up to the race, a practiced nutrition plan and a recon run on the route. I went into the race with a simple plan that involved running my own pace, staying consistent throughout the race, and running at the level I have been training at. In the same style as every other race I've done in the Chile, we started with a sprint and there were 20 to 30 people in front of me in the first 100m! The first three to four kilometers were on level ground with wide dirt roads or smooth single trail. In this first section I settled into a rhythm, overtook a few of the fast starters and enjoyed the company of my friend Max. Quite soon the climbing started, a few people ran passed me, and even though it was tempting I kept my effort level smooth. I was slowing compared to most people who attacked the climb, but I wasn't going to push the intensity too high up in only the first few kilometers as I knew from my recon that there was a lot of climbing to do. Running easy in the first few kilometers. With Max in the last flat before the climbing started. As the climbing continued, I slowly started to catch up with some of the faster starters who had held on for as long as they could. This first section was through a beautiful forest and it was a cool and calm morning to be running a race. I had a plan for this first part of the day so I didn't force myself to run faster. 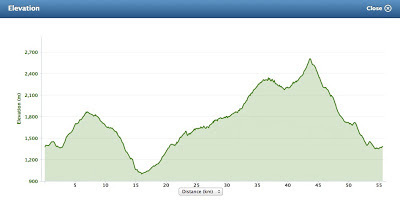 I maintained a run-walk pace right at the limit as the climbing was steep and it felt good. I was making progress and still feeling strong as we approached 15km of which almost all was climbing. The steepness of the trail meant that there were many switchbacks so there were sections that could be run in between the turns and more technical sections and turns that were better walked. By this point I was above the forest and the sun was bright and strong ahead. It was turning into a much hotter day than I had expected. Patrick came into sight above me and he was going well so I hoped that I could catch up with him and run with someone for a while. I caught Pat just before the top of the climb, and past a few other people at this point too, as we entered a plateau with plenty of rough vegetation to run through. It was a beautiful course and we climbed to the top of that peak in the middle! The top section of the race was absolutely spectacular. As we reached about 18km we could see over the top of the climb and the Andes stretched across the horizon. This part of the mountain is called "la mesa" because it's a large flat plateau like a table. It was an amazing sight to see and helped lift my spirits. Patrick and I ran along the top together as this helped us find the route a little more easily. It seemed as if the tape showing the way had been placed in a bird's eye view of the course, but the trails on the ground definitely weren't following the tape. We went off course a few times and couldn't really make fast progress as we were spending a lot of time looking and searching for our next orientation point. We took the time to eat some food and enjoy a slower pace. We were in the top ten and the route along the top hadn't seen much traffic yet so it was not always clear and we were half bush-whacking and half running in the little rivers that were less obstructed. At the 20km aid station we were told to head to the highest point ahead of us, that there was no marked route and that we should just run straight there. There was no one at the turnaround point and we only needed to take a small Chilean flag from the bag attached to a big Chilean flag and give this to the people at the 22km checkpoint to prove we'd made it. Pat and I remained together, although I was starting to feel a little sore and my hamstrings were aware of all the climbing we'd done. As we started descending Pat showed how strong he was and moved away from me with impressive speed. I wanted to go with him, but my legs didn't have what was required on the day. Making my way back down at a steady pace. I struggled on the downhills and I know this is from not being strong enough. I couldn't really pick up my speed and even though it was technical, that didn't slow me down any more than my legs were already slowing me. I settled into a pace and kept on running no matter how slow it felt. The descent really would allow for some fast running on straight and slightly technical sections, with slower running in the turns, but I was stuck in a steady pace and decided to maintain that pace for as long as I could. I must have been doing OK, because no one caught me, but I sure knew that I wasn't running as fast as I wanted to be running. By the time I reached the bottom of the descent and the final few kilometers to the finish I just wanted to be done running. I had been out on the course much longer than anticipated and I was ready to put my feet up. Fast and easy final few kilometers. I was happy to finish strong and running fast. However, I also started to feel a little more relaxed and I was able to run in the last three of four kilometers at a good pace. I was very happy to be running hard and have a little left in the tank at the end of the race. To me this meant that I had got my fueling right and that I'm getting much better at pacing for longer distance races. I ran strong all the way to the finish line and completed the course in 5hrs 41min for 7th place. It was a good day for me and I'm extremely pleased with how the race went. There's still room for improvement and a large gap to close to the leaders, but that's all work in progress.